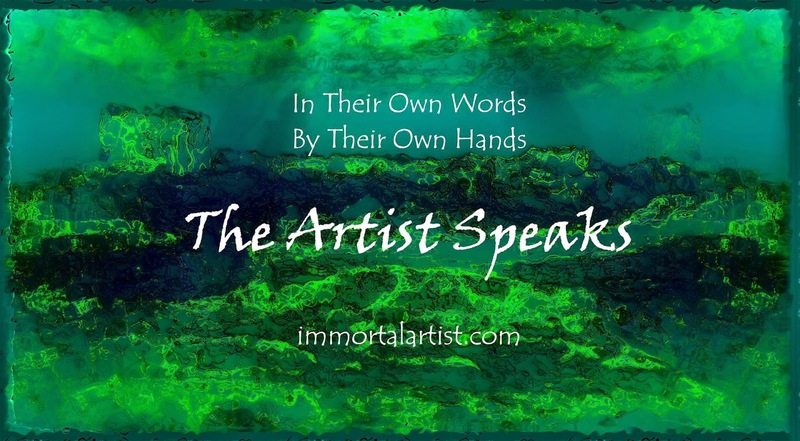 Immortal Artists seeks to give a venue for artists to discuss and show specific pieces of art. We want to give you a forum to talk about the history and development of specific pieces of art. If you would like more information please check out the following link. Acrylic, pen and ink on sculpted papers, on birch panel. Last October, after a year of musing upon and working around a large canvas slated for this particular project, I finally found space in my schedule to try my hand at a oversized, larger than life, furred animal -- an as yet untried challenge to my technique of pen and ink on sculpted paper. It was early in January of 2008 when serendipity brought me to my current practice of working with the properties of paper. Inspiration struck at a paper on canvas workshop spurring me to deviate from the instruction to deliberately form a recognizable subject, a tree. Fortuitously, a week previously I had purchased a medium new to me (acrylic inks), untried, but perfectly suited to work with this new surface I had made -- a tree formed out of a single medium weight sheet with a delicate and judicious application of tissue. Had I chose to use the paper in another manner I am certain I would not have made the pivotal discovery of material interaction, which influences the outcome of every piece. I explored, and continue to explore, my limitations working with pen nibs and their gravity dependant dipping inks, and how different papers influenced the outcome. It wasn't long before I realized I needed to identify which elements of my exploration could define a technique. Within my technique it was four years before I could form my smallest bird of three inches, and five years before I attempted a furred animal, a racoon -- a piece that went on to win an award. Twelve months after the racoon, I began work on "Scenting Sunshine," a fox surrounded by abstracted foliage. The fox itself is formed out of a single sheet of 2 feet wide by 5 feet long paper, a bond type similar to printer paper. For the background I applied in random sections papers of different weights and other properties. Though the fox was deliberately formed into a silhouette, I did not know how the background would develop. Often, the subject needs to be nearly completed before I can envision its surroundings due to the complexity of colour building ink line by ink line. It may also be interesting to note that due to the ink application with dipping inks and pen nib my reach is limited to the length of my arm, and the work itself has to lay closer to flat for gravity to pull the ink off the pen. Though it is still a challenge, I have become accustomed to working on any piece upside-down and sideways to reach all areas of the canvas. The fox is my greatest challenge in this regard as for the first time I had to handle the perspective of a figure at a size that was greater for me to see fully from arms length and from all sides. Completed October 21st, Scenting Sunshine debuted at Toronto's 2014 One of A kind Christmas show, where it proved to be a popular discussion piece and moved many. My treasured and favourite takeaways were when it brought tears to the eyes of a twenty-something young woman; the serious yet amusing response of a man who said "You know what this needs? A chair, and a glass of wine." And the sweetest, very senior woman who purchased a smaller work so she would remember the fox. Scenting Sunshine next showed at this Spring's local 38th Annual Muskoka Arts & Crafts member show. I'm pleased to share it received the Judges award for Excellence in Mixed Media, as well as voted People's Choice for Best in Show. I invite you to visit my website colmitchell.com to view more of my works, and or to connect with me on Facebook, Pinterest, Instagram or Twitter. Thank you so much for giving me and others space here to share. Much appreciated! I wish you and others great success with this series.